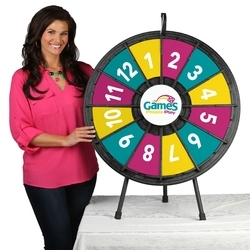 Create a winning event with our Prize Wheels and Games! Prize Wheels are ideal for convention exhibits, trade show booths, education, employee incentives, customer incentives, retail promos, lectures...any situation where you need to get your customer's attention! Set up your prize wheel and watch the crowds gather - Businesses of any kind, HR departments, sales and other training facilities, trade shows, schools, radio stations, fairs, concerts, sporting events, anything for prize giveaways. Really, there are dozens and dozens of applications? be creative! Everything you need comes with your prize wheel: The Wheel, the corresponding stand, a CD with templates for customizing your prizes, complete assembly instructions and all fasteners, wrenches and Allen Wrenches needed to assemble. Our Prize Wheels are quality made products. Black Wheels are made of a combination of extra tough ABS plastic and durable PETG plastic. Clear Wheels are made entirely of PETG. For Clicker Wheels, the clicker itself is made of virtually unbreakable nylon plastic, able to withstand hundreds of spins. The tabletop and floor stands and wall mounts are made of high quality, powder coated steel. 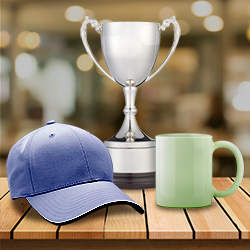 Customize your prizes with the templates we provide you - in both Microsoft Word and Adobe Illustrator format. You use ordinary 8 1/2" X 11" paper to create your own prizes. For color, you can use a color printer and/or colored paper, whatever suits your needs. Customizing the center logo works the same way. Click HERE to download an easy-to-use templates. Assembly is easy: instructions are included. Wheels can be assembled in less than 30 minutes. We recommend two people assemble the Super Prize Wheel. Though the Wheels are very portable while assembled within a facility and in a vehicle of sufficient size, they do need to be partially disassembled to transport in other instances, such as to and from a trade show. Travel cases are available if you need to transport your Prize Wheel. If you need to return your prize wheel for any reason, our warranty section clearly states: "The product must be shipped prepaid in the original packaging or substantially similar packaging providing an equal amount of protection." If a returned product is not resalable due to improper packaging, a restocking fee of 30% of the cost will be charged and shipping fees will not be reimbursed. Get Prize Wheels & Games Factory Direct! Our quality products are made to last, with a combination of tough ABS and PETG plastics. The armatures are made out of strong powder coated steel. Our prize wheels, raffle drums, Plinko and accessories are manufactured in the USA, just outside of Atlanta, Georgia. Each game arrives assembled and ready to go. Also includes software templates to customize your game with your logo and up to eight prizes. No labels required... use standard printer paper. Plinko Games are constructed of tough ABS plastic with a powder-coated steel stand. Each game includes three white Plinko pucks.